Within the space of mere 50 years exhibition stands have gone from being largely dull, cluttered shop-front imitations to multi-sensory blow-your-mind experiences. We’re going to chart their evolution in this article outlining what we think each era did well, and which did not. 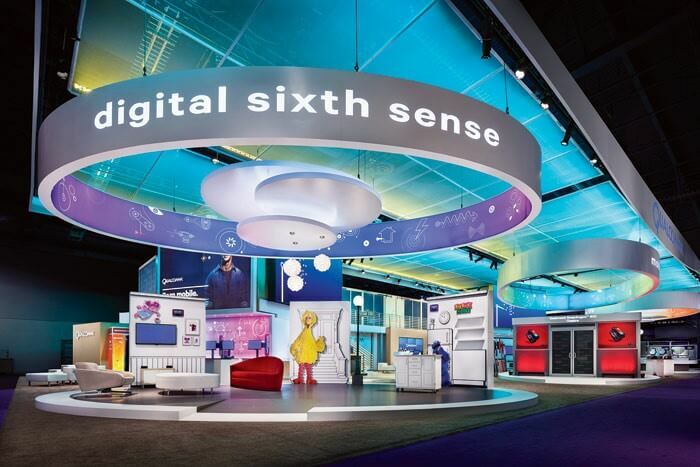 What’s good – IBM have really given their different devices and thus their visitors room to breathe within their exhibitions. We also really like the use of clear signage, as clear “data processing” and “typewriter ” signs are visible in the above image. 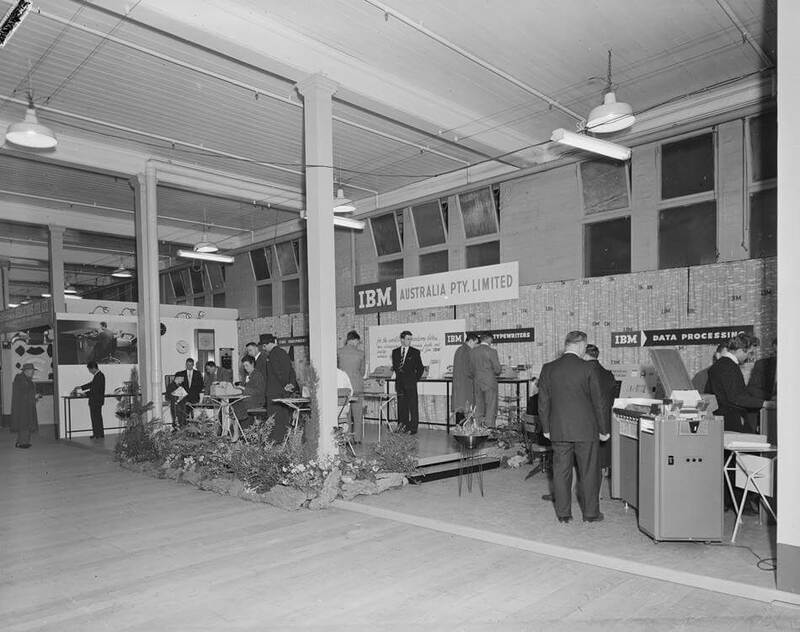 What’s not so good – As mentioned above, IBM have given their devices ample room, but a negative result of this is that the exhibition stand lacks a certain sense of cohesion. What’s good – We really like the slanted display stands against the back walls. 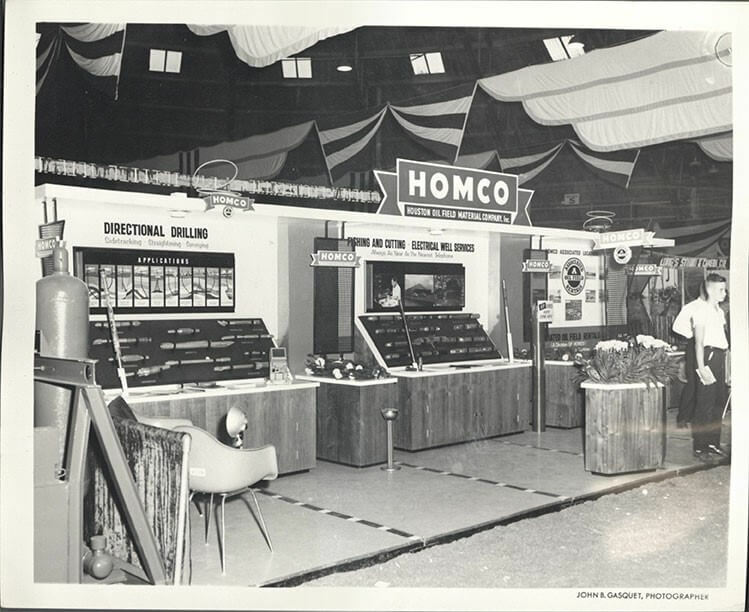 They add some depth and dimension to Homco’s exhibition stand. We’re also big fans of the clear signage against the back wall. What’s not so good – The use of floor space is very poor and not very exciting, as Homco opted to place everything against the back wall, leaving the vast majority of their floor space empty which makes their stand look uninviting. On the flip side the layout may enable passers-by to see what Homco is promoting more easily and thus attract a larger number of people to their stand. What’s good – Victaulic used a varied range of interesting and creative display methods and utilised the small space they had brilliantly. We especially like the display stand on the far right. 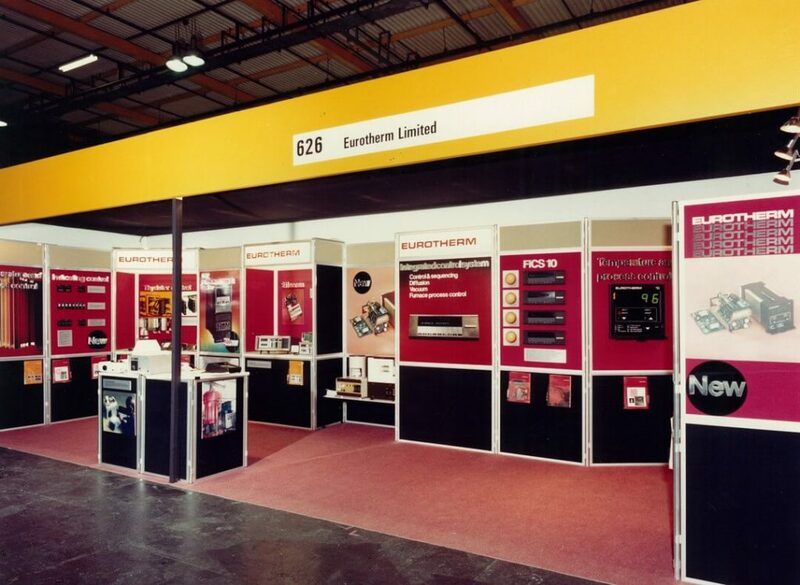 There is a robustness to the look of their exhibition stand that is very appealing. What’s not so good – The only major fault we can see is the lack of the company name and slogan in large lettering. It would have fit perfectly above the pipe and three lights in the back centre of the booth. 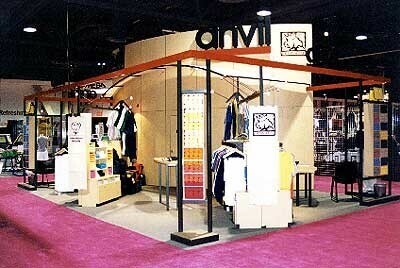 The use of the large logo would have further worked to add a greater sense of cohesion to their booth. What’s good – We like the use of deep red and black which helps guide the visitors eye. The hard division between the red and black colours also exudes ideas of robustness and quality. What’s not so good – Generally poor and unimaginative use of the exhibition space. The red and black stand could have been positioned as islands as opposed to just flat against the back wall, thus helping to immerse and involve the visitors in the content instead of making them feel they are reading some kind of 3D book. What’s good – We love how interestingly unconventional this exhibition stand is for the 90s, and thus how ahead of its time it was in its design. We especially like the curved element which gives the whole stand real presence and stature and shows off the Anvil logo spectacularly. 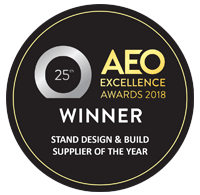 What’s not so good – More could have possibly been made of the floor space closest to the front of the stand and there was a great opportunity to add more to the lower half of the curved element. However, this may have detracted from the stand as opposed to improved it, as part of its attractiveness and boldness seems to be from the lack of, arguably, unnecessary elements on the curved element. A rapid advancement in manufacturing techniques along with the real increase in the speed of the technical revolution meant that exhibition stands from the period 2000 right to the present day are more ingenious, creative and awe inspiring than any time before. Materials can be bent and moulded in ways that were previously unimaginable. And thanks largely to Moore’s Law, technology gets smaller and more powerful at an exponential, not gradual rate, leading to things like razor thin interactive screens and pressure sensitive lighting in exhibition stands. Thus, as was mentioned at the start of this article, exhibition stands have shifted from being static card, paper and steel based rooms to becoming multi-sensory immersive experiences, breaking free from the prison of stale squares and rectangles. 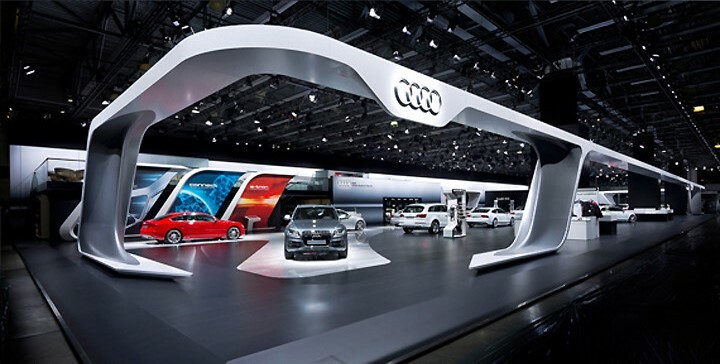 What’s good – Audi’s 2012 Moscow exhibition design is a remarkable feat of architectural brilliance. Just look at it. It manages to be interesting to look at it, whilst still maintaining an unmistakable minimalism. Featuring lines and shapes that would have been neigh impossible to create at a reasonable cost with pre 2000 technology and manufacturing techniques. What’s not so good – It can be argued that some may find the design to be somewhat arrogant and overpowering thus being repelled from stepping inside. But then again, it is housing some of the finest cars Audi has to offer. What’s good – Qualcomm’s 2013 CES exhibition stand is a truly immerse experience, hosting thirty demonstrations, fourteen meetings rooms and even a press area. And yes, the booth is over two stories. These multi-purpose exhibition areas are becoming incredibly popular, for the brands that can afford them. They are a smart move, as they encourage attendees to spend longer in the brands booth, thus increasing the chances of deeper brand engagement. This experiential approach is a stark contrast to the information and transaction based stands of the pre 2000 era. With regards to their booth, we especially like the use of colour and the inventive use of shape. To us, circular booths often appear more welcoming and inclusive than square/rectangular booths. But as always, what’s on the inside of the booth is just important as how it’s structured. What’s not so good – Potential for sensory overload? As with most things, if you push it too far you may get an undesired effect. Some attendees may be so overwhelmed by seeing the domineering, colourful booth that they pass up on it all together. 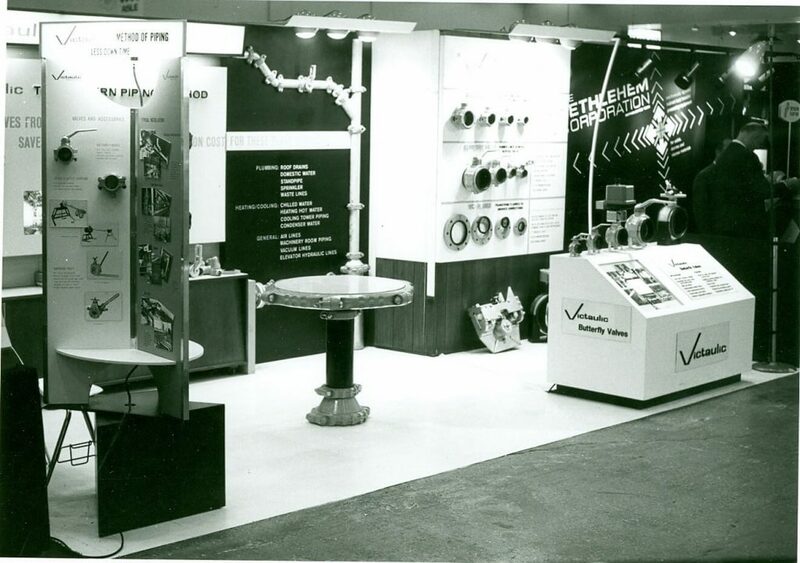 So there you have it folks, a full breakdown of the evolution of exhibition stands from the 60’s to the present day, with our own thoughts thrown in for extra measure. I hope you enjoyed our trip down exhibition memory lane.